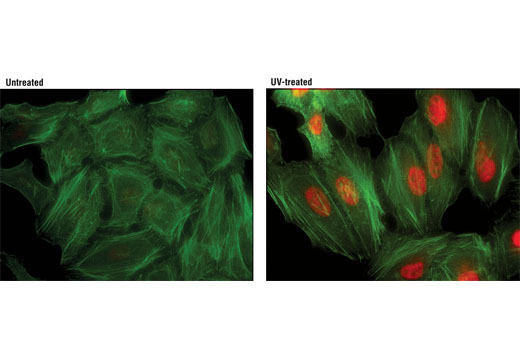 Immunofluorescent analysis of HeLa cells, untreated (left) or UV-treated (right) using Phospho-p38 MAPK (Thr180/Tyr182) (D3F9) XP® Rabbit mAb (Alexa Fluor® 594 Conjugate) (red). Actin filaments were labeled with Alexa Fluor® 488 phalloidin (green). Phospho-p38 MAPK (Thr180/Tyr182) (D3F9) XP® Rabbit mAb (Alexa Fluor® 594 Conjugate) recognizes endogenous levels of p38 MAPK only when phosphorylated at Thr180 and Tyr182. This antibody does not cross-react with the phosphorylated forms of either p44/42 MAPK or SAPK/JNK. Monoclonal antibody is produced by immunizing animals with a synthetic phosphopeptide corresponding to residues surrounding Thr180/Tyr182 of human p38 MAPK protein.